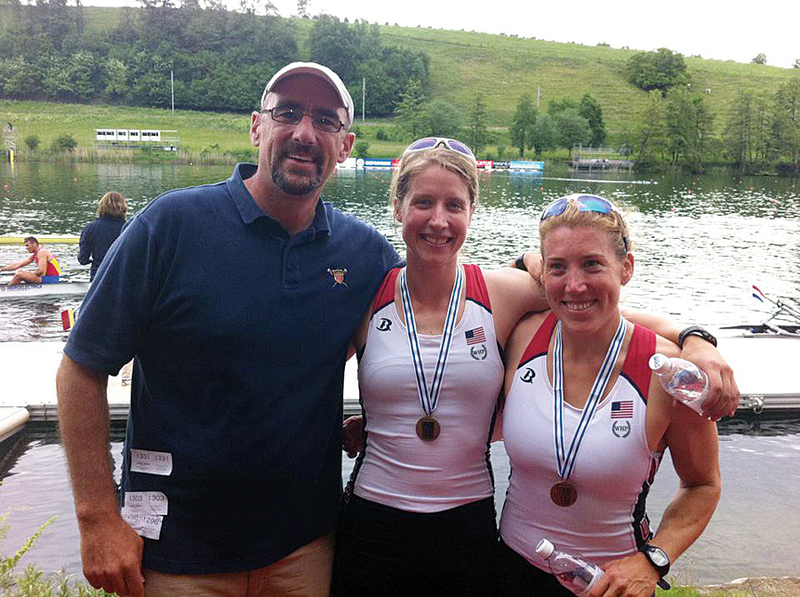 Coach Matt Madigan and his crew of Sarah Trowbridge and Margot Shumway earned a spot to race at the Olympics in the women's double sculls by finishing first at the Olympic Qualification Regatta in Lucerne, Switzerland, in 2012. Matt Madigan, like many Esri employees, says that one of the reasons he enjoys his job is that he gets to work in a variety of roles. However, Madigan’s situation is a little unique. He works out of two offices. His main job is as an account manager in the Washington, DC, regional office. He also works with start-ups and a start-up incubator out of Esri R&D Center—DC. In this interview, he talked about enjoying the challenges he encounters in his professional and personal life. Tell us about your work with Esri. As an account manager, I’m responsible for a couple of accounts on the intel [information and technology] team. Previously, I was the operations director and director of federal business at GeoIQ [a geolocation company that joined Esri in 2012]. We were working with In-Q-Tel and deployed at many agencies within the intelligence community, so that carried over into my role on Esri’s federal team because I was very familiar with the community. My work at the R&D Center is also really exciting. Last fall, we started a relationship with 1776, which is a start-up incubator with 240 plus member companies. 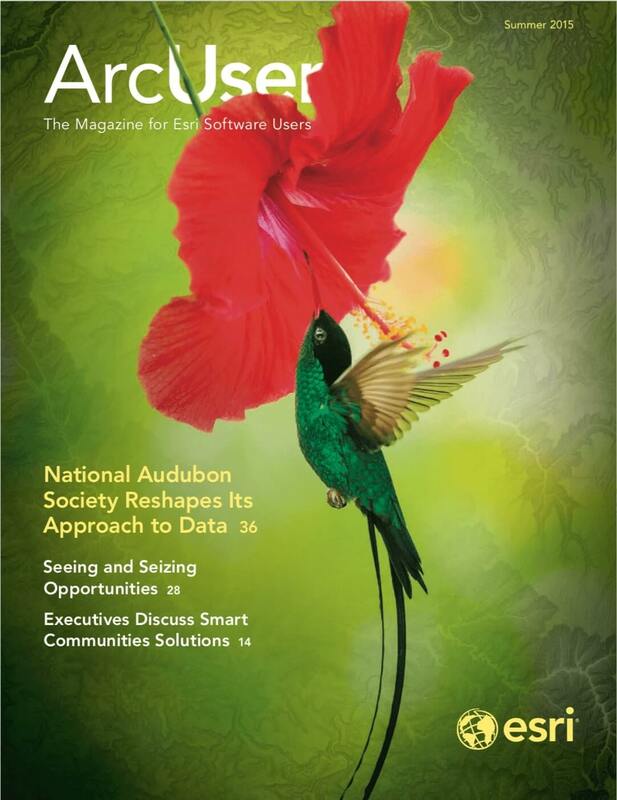 We want to empower them with the ArcGIS platform and then let them bring their innovation to that platform. So instead of having to build a new GIS out of open source, they’re using our tools to actually build out their solutions. I understand you’re also involved with Esri’s new Young Professionals Network. What’s that about? This is an initiative to get young professionals in the federal government, commercial, nonprofit, developer, and start-up communities to become more familiar with Esri tools. More importantly, it’s a forum for them to see how these tools can help them move forward both in their careers and with their projects. The Young Professionals Network had its first meeting at the Esri Federal GIS Conference in February. Nearly 500 attended and took advantage of career and GIS employment workshops, a Q&A session with [Esri president] Jack Dangermond and other Esri leaders, and a networking happy hour. I was told you were a rowing coach for the Olympics. Yes, that’s true. That was in 2008 in Beijing and 2012 in London. China was amazing—the excitement of being at my first Olympics was just incredible. In Beijing, I was fortunate to represent the rowing team and march in the opening ceremonies, which is beyond words. And how did you get involved in that? I had been a rower for a long time and was on a couple of world championship teams. After working with the sports scientists at the US Olympic Committee in Colorado Springs, I had a pretty good idea on program design. I had trained with prominent national team coaches as an athlete and coach. My second summer of coaching, I formed a boat that won trials, went on to the world championships, and won a bronze medal. In my third year of coaching, we had several boats win Pan American Games medals. When the following generation of athletes came in, we continued to do well winning medals at the national and international levels, and so it just kind of blossomed from that. At GeoIQ, we started GeoCommons, which enabled a community of people to easily share GIS data in a variety of formats and do some basic map visualization and analytics. Many rowers in my program needed part-time jobs. We hired them at GeoIQ to recruit data, clean it up, and load it into GeoCommons as foundational data. I would coach them in the morning, they’d work for five or six hours at GeoIQ, and then we would go back to the boathouse and row in the afternoon. It became a very close-knit group of people who came here for one reason, but then they started their careers in GIS. I run coaching clinics now and then. There are a couple of people at Potomac Boat Club I’m helping this spring. One of them won a gold medal in 2012 in London and the other one is an up-and-comer who shows a lot of potential. Are there things about Esri you feel are different compared to other software companies or other organizations in the GIS space? I really like the atmosphere around Esri where Jack really cares about his customers and the communities he works with. He’s interested in what his customers are doing and ensuring they are successful. The fact that he’s donating $1 billion in software to schools through the ConnectED Initiative and trying to create a GIS mentoring system in schools is so important for STEM education. He really has his heart in the right spot, and when you can work for an organization where you get that from the owner, it empowers us as employees to make a difference.